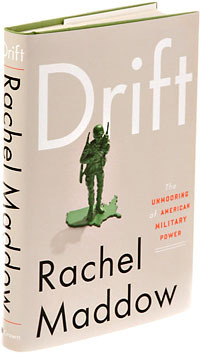 economy still sluggish, and domestic politics dominating the headline, Maddow decided to write a book about America and the way we use our military. Specifically: Why is it so damn easy to go to war these days? It’s a good question, and it’s unfortunate that it’s regularly trivialized by mountains of snark. This is Maddow’s stock in trade, of course, and I guess you have to expect a certain amount of it. But this is a more thoughtful book than it sometimes lets on, and the snark too often obscures that. It also, I suspect, makes the book off-putting for anyone who’s not already a fan. If you can get past that, though, there’s a deadly serious argument here that deserves way more attention than it gets. The book is, basically, a series of potted histories that explain how we drifted away from our post-Vietnam promise to make sure we never again went to war without the full backing and buy-in of the American public. Maddow’s premise is that, just as the founders intended, our aim was to make war hard. Presidents would need Congress on their side. The Abrams Doctrine ensured that reserves would have to be called up. Wars would no longer unfold almost accidentally, as Vietnam did. And for a while that was the case. Sure, there was Grenada, but that was a small thing. And the contras in Central America and the mujahideen in Afghanistan. But the real breakdown, Maddow says, started almost accidentally at the end of the Reagan administration, when Attorney General Ed Meese, desperate to defend Reagan’s conduct in the Iran-Contra scandal, insisted that the president had the right to ignore congressional restrictions on his war-making capability. His commander-in-chief powers gave him all the authority he needed to do anything he wanted. By the time Bill Clinton left office in 2001, an Operation Other Than War, as Pentagon forces called them, could go on indefinitely, sort of on autopilot—without real political costs or consequences, or much civilian notice. We’d gotten used to it. By 2001, the ability of a president to start and wage military operations without (or even in spite of) Congress was established precedent. …By 2001, the spirit of the Abrams Doctrine—that the disruption of civilian life is the price of admission for war—was pretty much kaput. By 2001, we’d freed ourselves of all those hassles, all those restraints tying us down. And it only got worse after that. The CIA and JSOC have become largely unaccountable branches of the military. Drone warfare has lowered the cost of war even further. And the reserves are no longer really reserves. They’re practically full-time soldiers. And the worst part is that all of this is virtually invisible to most of us. The vast bulk of the civilian population, especially among the college-educated elites who run the country, doesn’t serve in the military and never has. In a lot of cases, we barely even know people who have. When we go to war, there’s no WWII-style rationing to worry about, there’s no draft, and there aren’t even any taxes to pay. It’s all free! Is it any wonder that we fight so many wars? Maddow’s argument is that we need to start rolling back these changes of the past two decades. When we go to war, we should raise taxes to pay for it. We should get rid of the secret military. The reserves should go back to being reserves. We should cut way back on the contractors and let troops peel their own potatoes. And above all, Congress should start throwing its weight around again. It’s fine to criticize presidents for accreting ever more power to themselves, but what do you expect when Congress just sits back and allows it to happen? Our real problem is congressional cowardice: They don’t want the responsibility of declaring war, but they also don’t want the responsibility of stopping it. So they punt, and war becomes ever more a purely executive function. It’s a powerful argument, and one that deserves a whole lot more attention than it gets. Snark and all, Drift is recommended reading.